Julianne Moore and Mia Wasikowska at the California premiere of "The Kids Are All Right." Julianne Moore at the premiere of "Blindness" during the 61st International Cannes Film Festival. Onata Aprile as Maisie and Julianne Moore as Susanna in "What Maisie Knew." Julianne Moore as Susanna and Onata Aprile as Maisie in "What Maisie Knew." Julianne Moore at the California premiere of "The Kids Are All Right." Julianne Moore in "Savage Grace." Julianne Moore at the BVLGARI celebration of Elizabeth Taylor's collection in Beverly Hills. 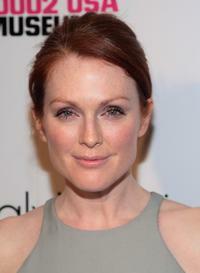 Julianne Moore at the New York premiere of "Chloe." Julianne Moore in "6 Souls." Julianne Moore and Maggie Gyllenhaal at the grand reopening of the New Museum. Julianne Moore at the cocktail reception for the 150th Anniversary dinner of Boucheron. Julianne Moore, Maggie Gyllenhaal and Kate Winslet at the Boss Black Spring/Summer 2008 collection show. Julianne Moore at the premiere of "Savage Grace". Julianne Moore as Catherine Stewart and Liam Neeson as David Stewart in "Chloe." Julianne Moore as Charley in "A Single Man." Liam Neeson as David Stewart and Julianne Moore as Catherine Stewart in "Chloe." Amanda Seyfried as Chloe and Julianne Moore as Catherine Stewart in "Chloe." Julianne Moore as Jules in "The Kids Are All Right." Annette Bening as Nic and Julianne Moore as Jules in "The Kids Are All Right." Julianne Moore at the Boss Black Spring/Summer 2008 collection show. Julianne Moore at the grand reopening of the New Museum. Julianne Moore and Francisco Costa at the Calvin Klein After Party during the Mercedes-Benz Fashion Week Spring 2008. Julianne Moore and Jean Todt at the 150th Anniversary dinner of Boucheron. Julianne Moore, Francisco Costa and Kate Bosworth at the Calvin Klein After Party during the Mercedes-Benz Fashion Week Spring 2008. Julianne Moore at the 150th Anniversary dinner of Boucheron. Julianne Moore and Jean Christophe Bedos at the cocktail reception for the 150th Anniversary dinner of Boucheron. Julianne Moore and Tea Leoni at the UNICEF 2007 Snowflake Ball. Julianne Moore as Mother Malkin in "The Seventh Son." Julianne Moore at the premiere of "I'm Not There". Steve Carell as Cal Weaver and Julianne Moore as Emily Weaver in "Crazy, Stupid, Love." Julianne Moore and Belen Rueda at the premiere of "Savage Grace". Julianne Moore, Belen Rueda and Eddie Redmayne at the premiere of "Savage Grace". Julianne Moore and Bart Freundlich at the dinner for a screening of "I'm Not There". Julianne Moore at the UNICEF 2007 Snowflake Ball. Julianne Moore and Bart Freundlich at the UNICEF 2007 Snowflake Ball. Julianne Moore at the New York premiere of "Freeheld." Julianne Moore at the California premiere of "Non-Stop." Julianne Moore at the New York special screening of "Seventh Son." Julianne Moore at the New York premiere of "The Hunger Games: Mockingjay - Part 2."